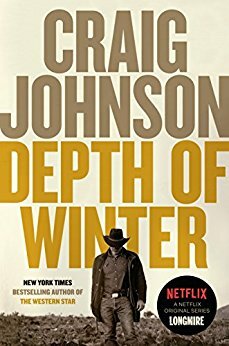 Enter this book giveaway to grab an advanced reader copy of Depth of Winter: A Longmire Mystery by Craig Johnson. If you love the Netflix series, pick up the latest book in the series. Giveaway begins September 28, 2018 at 12:01 A.M. PDT and ends October 5, 2018, at 11:59 P.M. PDT. Winners will be selected at random on or about October 6, 2018. I want to win because it sounds like a great read. Big fan of the show, would love to read this. I want to win this for my husband. He likes Longmire. We enjoyed the TV show, but would enjoy a Longmire book as well! Maybe more! & it looks like a good read. I want to read this and then share it with my brother. Husband is big Longmire fan. He will definitely enjoy this. I loved this series on Netflix and would like to own the book! I want to win because I’ve watched the TV series and it’s awesome! I enjoy western style books and movies. I want to win this book because I’ve heard that it’s a great read. Thanks for the giveaway! I would love to read this as I am a big fan of Longmire tv series. I loved the TV movies.